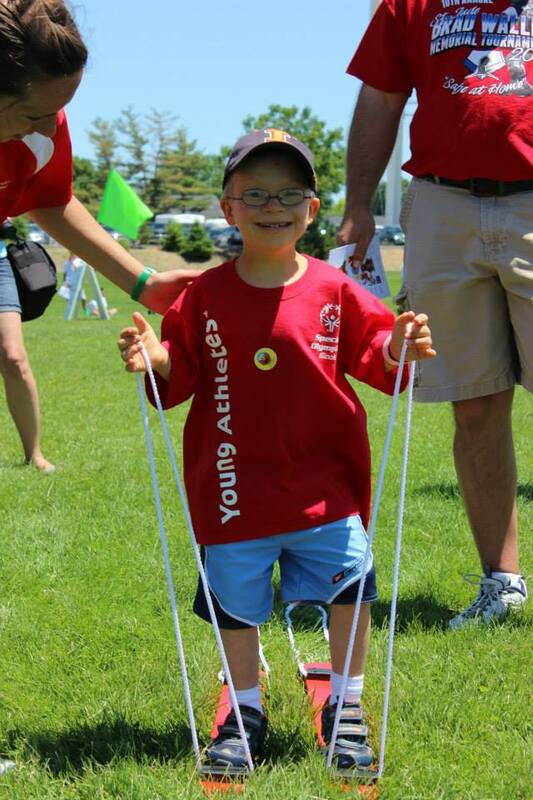 Nicholas Jess of Mattoon is following in his brother William’s footsteps as a Special Olympics Young Athlete. William, now 12, first competed as a Young Athlete and now Nicholas is too. Their bond as brothers increased over the years through this program. 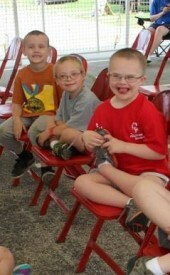 William started in Young Athletes at Camp New Hope when he was 4 years old. 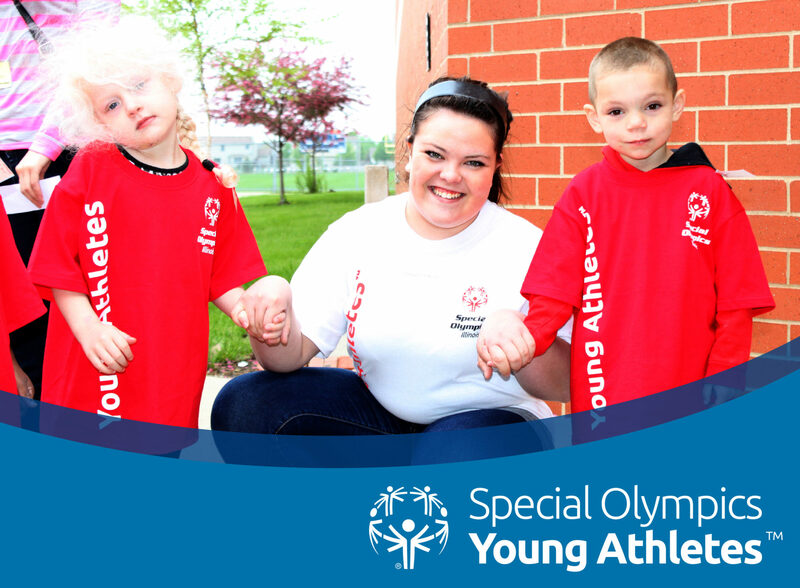 After finishing Young Athletes, William transitioned into Special Olympics as a traditional athlete. William now participates in track and field and basketball. He competed in the 100-meter run, 4×100-meter relay and running long jump. William’s favorite sport is running long jump. Nicholas began Young Athletes when he was 2 years old at Eastern Illinois University’s program and now competes independently. 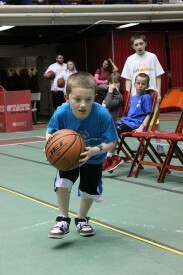 Nicholas, now 6, has participated in Young Athlete exhibitions in snowshoeing and basketball at state competitions. His favorite sport is snowshoeing because he enjoys running. 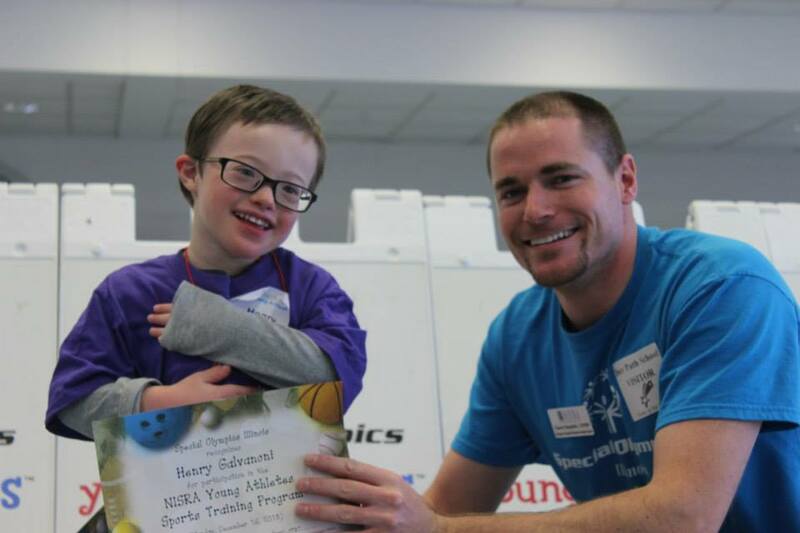 He recently participated at the Special Olympics Illinois State Basketball Tournament as a Young Athlete and William volunteered at his side. 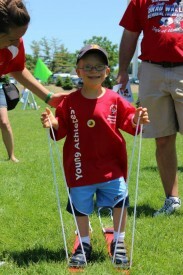 When Nicholas first began Young Athletes, he was not able to run or jump and was nonverbal until he was 3. Mother Laura Jess described his burst in energy as a lightbulb turning on. Now he uses Young Athletes as an outlet to release his energy. 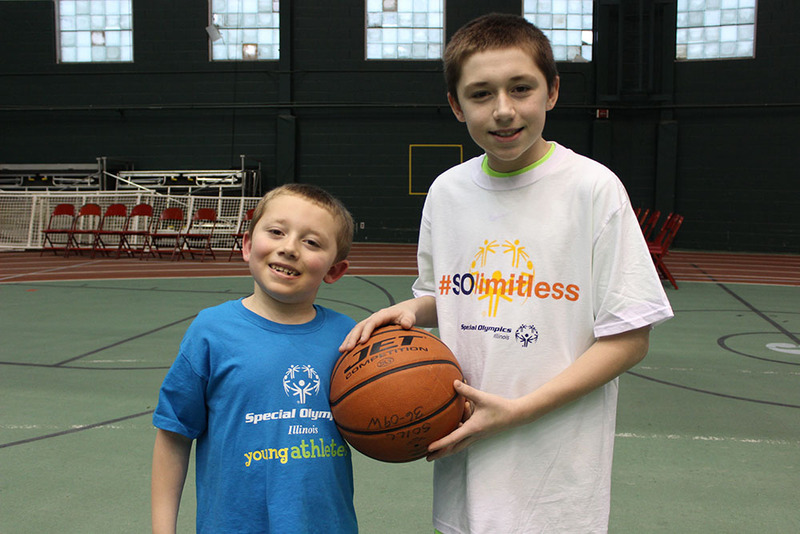 William practiced basketball with Nicholas at home to prepare for the State Basketball Tournament. William’s advice for Nicholas in future events is to “be fast.” We can expect the duo to continue participating in Special Olympics while strengthening their bond. View photos from the 2016 State Basketball Tournament. Sadie Fiedler is a well-rounded 7-year-old from Rochester who is a social butterfly and loves to be surrounded by friends. 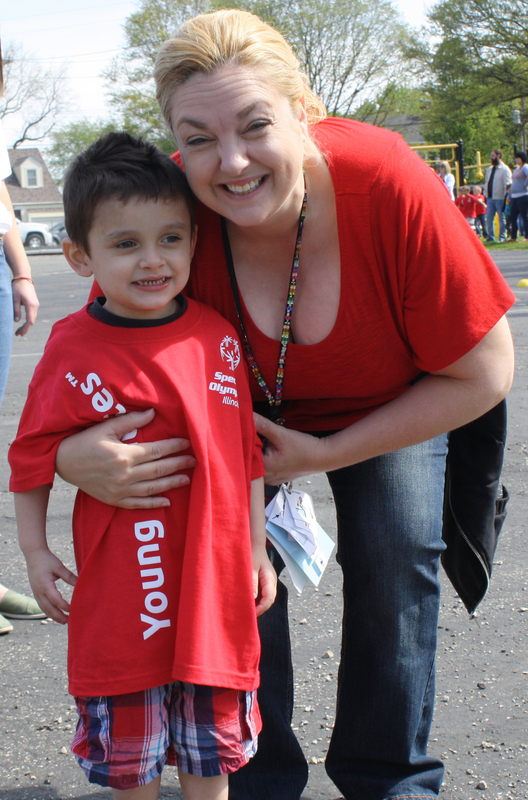 Although she’s only in first grade, Sadie has already had a lot of opportunities with Special Olympics and beyond! She started her sporting career with gymnastics by practicing at CheerZone in Springfield at the age of 5. 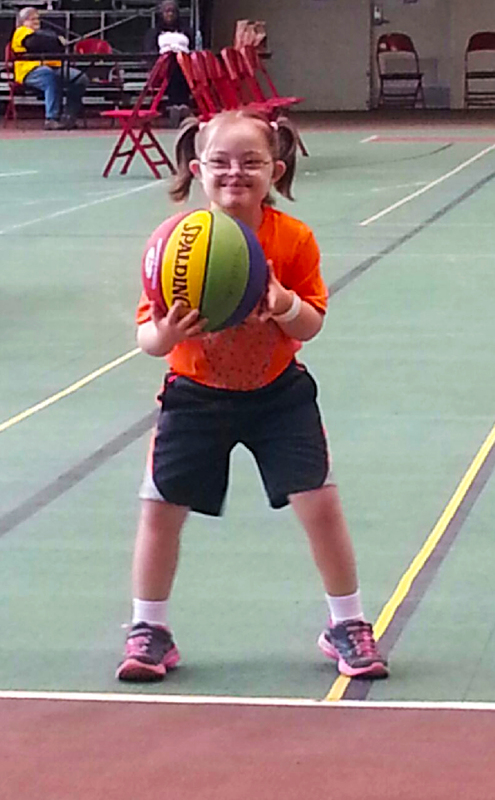 Loving being active, Sadie wanted to try more sports and, in October 2013, Sadie tried her hand at basketball. Her mother, Barb Fiedler, worked with Special Olympics staff to sign Sadie up for her first Special Olympics Young Athletes exhibition. Sadie participated in basketball individual skills at the State Basketball Tournament. 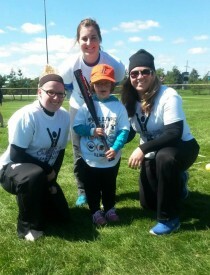 She had such a great experience that she wanted to try EVERY sport Special Olympics has to offer. Sadie has now participated at Summer Games soccer skills exhibition in Normal and Outdoor Sports Festival softball individual skills exhibition in Decatur. Next up for Sadie is Winter Games snowshoeing exhibition in Galena. She is also learning to swim and bowl. Through participating with various sports and activities, Sadie has been able to meet and make friends all over Central Illinois! 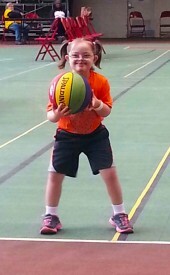 Outside of Special Olympics sports, Sadie is one busy little girl. She is starting in her 3rd year of special needs cheerleading. In addition to being very athletic, Sadie also has a creative arts side. She has been in music classes since she was 2. She also started ballet, tumbling and tap dancing at the age of 16 months. And just recently, Sadie has been in involved with four beauty pageants. This opportunity has really encouraged her to answer questions on stage with a lot of people watching. She really enjoys the attention. Sadie is also very involved in 4-H; she just finished her 2nd year in the program. 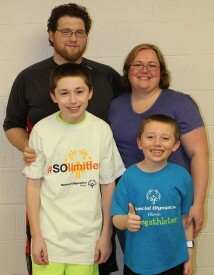 Sadie has amazingly supportive family with her two brothers, Jake, 15, and Scott, 10, and mom and dad. Her brothers love to watch and coach Sadie with all of her sports. She also loves to coach them with their sports, mainly wrestling. She also has a pet cockatiel that she is training to talk and do tricks. We are so happy to have such an incredible family and athlete as part of our organization. 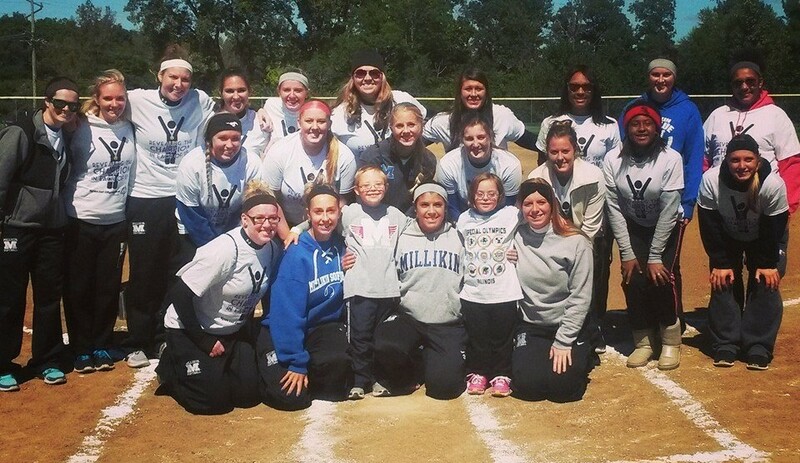 We look forward to seeing what Sadie accomplished in her Special Olympics career in the future. Bo Gill is a caring and lovable 7-year-old from Morton. He attends Lincoln Elementary and has been participating with Morton School District for the past two years. His favorite activity is the 50-meter run. Really, any time he gets to run, he loves it! Bo is a Young Athlete who practices with a traditional agency to participate at state- and Area-level exhibitions for Young Athletes. He has attended Summer Games and Spring Games participating in athletics (tennis ball throw and 50-meter run). When Bo isn’t working on his running skills he also likes to play baseball, watch soccer and he loves swimming. He also started to take golf lessons and has begun training for downhill skiing! Bo has two sisters and a brother and recently became an uncle! We’re so excited to have such a great Young Athlete and family involved with the Young Athletes Program and can’t wait to see what is in store for him in the future! 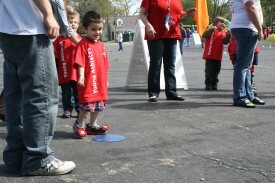 Sidik (Dino) Bekteshi is an energetic 3-year-old from Bethany. Although Dino has only been in the Young Athletes Program a short time, he has already shown vast improvement. His favorite activity is throwing or anything that involves playing with any type of sports balls. When Dino isn’t practicing with the Young Athletes Program, he enjoys reading books, piecing together puzzles and, of course, playing outside. He also loves hanging out with his older sisters, Mia and Albina. We’re so excited to have such a great Young Athlete and family involved with the program and can’t wait to see what is in store for them! Henry Galvanoni is an engaging 4-year-old who is always happy to give you a handshake, a hug or a high five! Most people who meet Henry for the first time recognize his smile and beaming expression that instantly warm your heart. When Henry is not participating with the Young Athletes Program, he is busy being the older brother to 1-year-old Eva. He also loves transportation – cars, planes, trains – he loves to play with them and ride in them. He is fascinated by anything that is mechanical. He also loves animals and can identify many zoo animals and their sounds. We are so lucky to have Henry and his family be a part of the Young Athletes Program and can’t wait to see what is in store for him with his Special Olympics career.